Karen is currently a volunteer for the Fuse Factory and works directly with the Frequency Friday Series. She is an OSU graduate in Art Education and volunteered for a number of years at the infamous Acme Art Gallery in the Short North in the 1990′s, at one time serving on the Board. Acme was known for its cutting-edge and controversial art for most of it’s long life (it ended in the early 2000′s). This gallery also hosted musical and performance artists and Karen was a member of such a group named Gaga that got its start at Acme. Gaga used electronic, industrial elements and fire in its shows, all of which was experimental and improvisational in nature. 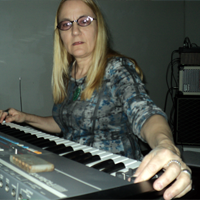 After Gaga, Karen played in a more conventional band called Faded Sympathy but is now a member in a free-form purely electronic trio called Tone Elevator which has played in many Frequency Friday shows. Karen currently works at a non-profit agency that provides guardianship services for mentally/physically disabled adults all over the state of Ohio.